A group of ten strangers receive correspondence summoning them to a small island off the coast of Devon for a weekend retreat. Upon arrival, their host is nowhere to be found. Once settled, a recording plays accusing each individual member of the party of a past murder. As time passes, guests begin dropping like flies. Who is doing the killing? Is there an eleventh unknown guest on the island or is a member of their own party responsible? 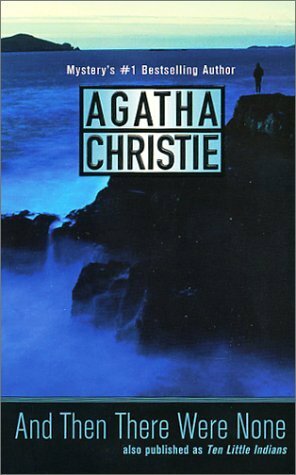 And Then There Were None has the distinction of being Agatha Christie’s most successful novel but it was also, as described by her, her most difficult to write. It has sold over 100 million copies worldwide, in multiple languages, and is arguably the world’s most famous mystery novel. It’s a wonder it took me so long to pick it up. While I had started this earlier in the week, I read the majority of it in one afternoon. Once the murders began, the book became impossible to put down. I would be shocked if anyone who is unfamiliar with the story could have possibly guessed who was behind the killings as the level of misdirection by Christie is second-to-none. As I neared the end and the identity of the offender became no less clear, I was beginning to worry that I would feel cheated or the eventual revelation would be a cop-out but I was both surprised and satisfied with the ending. What more could be said about this book? It’s an absolute classic, a definite tent-pole of the mystery genre, and I’d go so far as to consider this required reading for fans of mysteries and thrillers alike. Sure, there are better crime novels out there, but Christie’s influence can be felt throughout the work of many talented writers today.